Every once in a while I read papers or articles. Previously, I've just read them myself, but I was wondering if there were more useful things I could do beyond that. So I've written up a summary and my thoughts on an article I read - let me know if it's useful! I recently read Curing the Vulnerable Parser: Design Patterns for Secure Input Handling (Bratus, et al; USENIX ;login: Spring 2017). It's not a formal academic paper but an article in the Usenix magazine, so it doesn't have a formal abstract I can quote, but in short it takes the long history of parser and parsing vulnerabilities and uses that as a springboard to talk about how you could design better ones. It introduces a toolkit based on that design for more safely parsing some binary formats. The Language-theoretic approach (LANGSEC) regards the Internet insecurity epidemic as a consequence of ad hoc programming of input handling at all layers of network stacks, and in other kinds of software stacks. 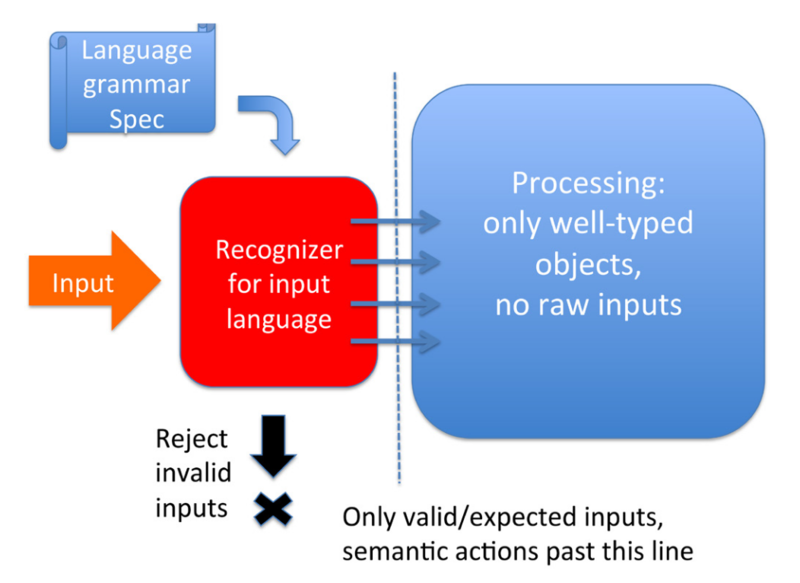 LANGSEC posits that the only path to trustworthy software that takes untrusted inputs is treating all valid or expected inputs as a formal language, and the respective input-handling routines as a recognizer for that language. The recognition must be feasible, and the recognizer must match the language in required computation power. Trustworthy input is input with predictable effects. The goal of input-checking is being able to predict the input’s effects on the rest of your program. Safety is predictability. When it's impossible to predict what the effects of the input will be (however valid), there is no safety. From the viewpoint of language-theoretic security, a catastrophic exploit in Ethereum was only a matter of time: one can only find out what such programs do by running them. By then it is too late. I'm not sure that (a) I buy the assertions, or that (b) they provide a useful way to deal with the world as we find it. this language should be as simple as possible, ideally being regular and context-free. Neither of these are bad ideas - in fact they're both good ideas - but I don't know that I draw the same links between them and security. Consider PostScript as a possible counter-example. It's a Turing-complete language, so it absolutely cannot have predictable results. It has a well documented specification and executes in a restricted virtual machine. So let's say that it satisfies only the first plank of their argument. I'd say that PostScript has a good security record, despite being Turing complete. PostScript has been around since 1985 and apart from the recent bugs in GhostScript, it doesn't have a long history of bugs and exploits. Maybe this just because no-one has really looked, or maybe it is possible to have reasonably safe complex languages by restricting the execution environment, as PostScript consciously and deliberately does. Indeed, if you consider the recent spate of GhostScript bugs, perhaps some may be avoided by stricter compliance with a formal language specification. However, most seem to me to arise from the desirability of implementing some of the PostScript functionality in PostScript itself, and some of the GhostScript-specific, stupendously powerful operators exposed to the language to enable this. The bugs involve tricks to allow a user to get access to these operators. A non-Turing-complete language may be sufficient to prevent these attacks, but it is not necessary: just not doing this sort of meta-programming with such dangerous operators would also have worked. Storing the true values of the security state outside of a language-accessible object would also be good. Is this a useful way to deal with the world as we find it? My main problem with the general LangSec approach that this article takes is this: to get to their desired world, we need to rewrite a bunch of things with entirely different language foundations. The article talks about HTML and PDFs as examples of unsafe formats, but I cannot imagine the sudden wholesale replacement of either of these - although I would love to be proven wrong. Can we get even part of the way with existing standards? Kinda-sorta, but mostly no, and to the authors' credit, they are open about this. They argue that formal definition parsing the language should be the "most restrictive input definition" - they specifically require you to "give up attempting to accept arbitrarily complex data", and call for "subsetting of many protocols, formats, encodings and command languages, including eliminating unneeded variability and introducing determinism and static values". No doubt we would be in a better place if people took up these ideas for future programs. However, for our current set of programs and use cases, this is probably not tractable in any meaningful way. In short, the article is full of great ideas if you happen to be parsing a simple language, or are designing not just a parser but a full language ecosystem. They do also provide a binary parser toolkit that might be helpful if you are parsing a binary format that can be expressed with a parser combinator. Overall, however, I think the burden of maintaining old systems is such that a security paradigm that relies on new code is pretty unlikely, and one that relies on new languages is fatally doomed from the outset. New systems should take up these ideas, yes. But I'd really like to see people grappling with how to deal with the complex and irregular languages that we're stuck with (HTML, PDF, etc) in secure ways. Quite often when building small Linux images having separate user accounts isn't always at the top of the list of things to include. Petitboot is no different; the most common operations like mounting disks, configuring interfaces, and calling kexec all require root and Petitboot generally only exists long enough to boot into the next thing, so why not run it all as root? The picture is less clear when we start to think about what is possible to do in Petitboot by default. If someone comes across an open Petitboot console they're only a few keystrokes away from wiping disks, changing files, or even flashing firmware. 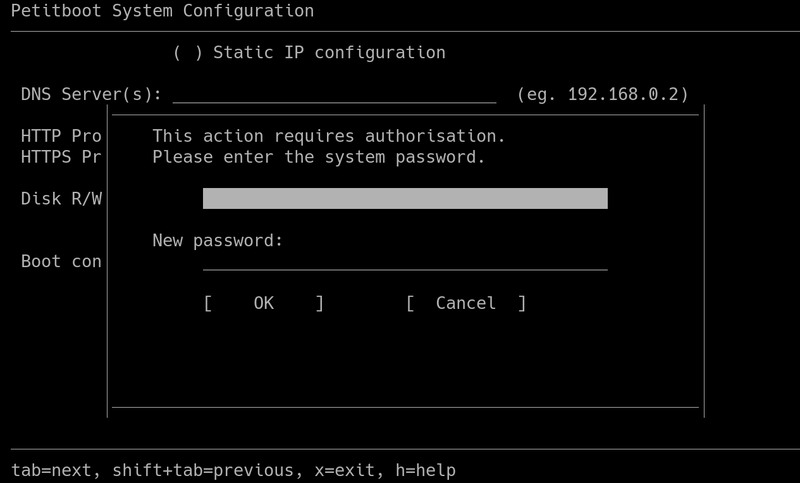 Depending on how your system is used that may or may not be something you care about, but over time there have been a few requests to "add a password screen to Petitboot" to at least make it so that the system isn't open season for whoever sees it. 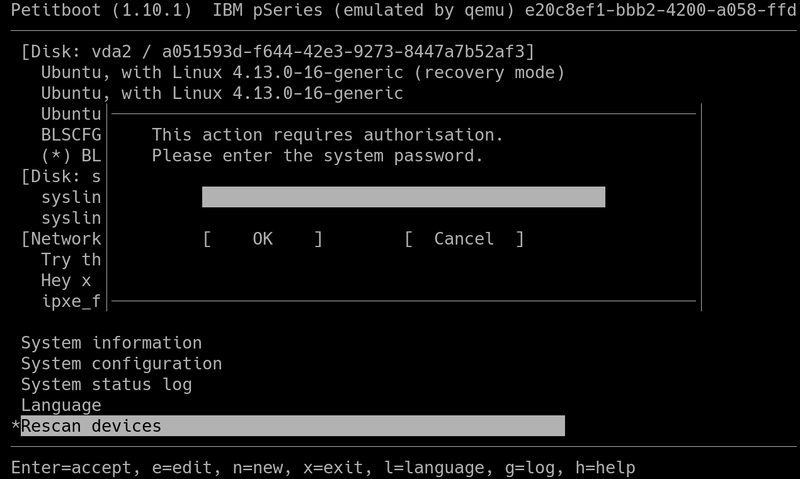 Exiting to the shell gives the user root permissions as well. There is already a mechanism to prevent the user exiting to the shell, but this puts all of our eggs in the basket of petitboot-nc being a secure program. If a user can accidentally or otherwise find a way to exit or crash the UI then they're immediately in a root shell, and while petitboot-nc is a good UI it was never designed to be a hardened program protecting the system. The idea instead as of Petitboot v1.10.0 is not to care if the user drops to the shell; because now it's completely unprivileged. The only process now that runs as root is pb-discover itself; the console, UI, and helper scripts run as a new 'petituser'. For the server and clients to still communicate the "petitiboot.ui" socket permissions are modified to allow processes that are part of the 'petitgroup' to connect. 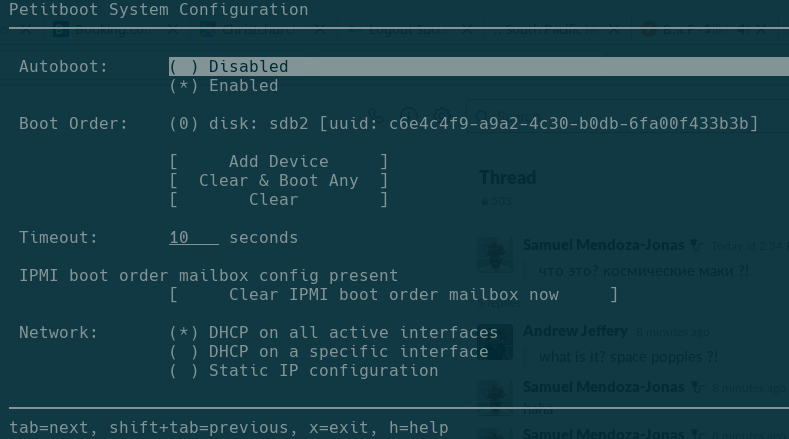 However now if pb-discover notices that a client in the petitgroup is connecting (or more accurately the client isn't running as root) by default it ignores any commands from it that would configure or boot the system. Then the password is sent to the server, checked, and if correct the action goes ahead. Petitboot of course runs in memory, and writing a root password into the image itself would mean recompiling to change the password, so instead Petitboot pulls the root password from NVRAM. On startup Petitboot reads the petitboot,password parameter which is the hash of the root password and updates /etc/shadow with it. This happens before any clients are up or can connect to the server. This sends an authentication command to the server, and assuming the client is authenticated with the current password as well pb-discover updates the shadow file, and writes the hash back to NVRAM. User support exists in Petitboot v1.10.0 onwards. You will also need some support in your build system to set up the users, see how op-build did it for an example. There are a few items on the TODO list still which would be good to have. For example storing the password hash in an attached TPM if available, as well as splitting out more of what runs as root; for example the bootloader parsers in pb-discover preferably wouldn't run with root privileges, but they are all part of the one binary. As always, comments, suggestions, and patches welcome on the list! On platforms that support it Petitboot can interact with the inband IPMI interface to pull information from the BMC. One particularly useful example of this is the "Get System Boot Options" command which we use to implement boot "overrides". By setting parameter 5 of the command a user can remotely force Petitboot to boot from only one class of device or disable autoboot completely. This is great for automation or debug purposes, but since it can only specify device types like "disk" or "network" it can't be used to boot from specific devices. Alexander Amelkin pointed out that the "Get System Boot Options" command also specifies parameter 7, "Boot Initiator Mailbox". This parameter just defines a region of vendor-defined data that can be used to influence the booting behaviour of the system. The parameter description specifies that a BMC must support at least 80 bytes of data in that mailbox so as Alex pointed out we could easily use it to set a partition UUID. But why stop there? Let's go further and use the mailbox to provide an alterate "petitboot,bootdevs=.." parameter and let a user set a full substitute boot order! Parameter 7 has two fields, 1 byte for the "set selector", and up to 16 bytes of "block data". The spec sets the minimum amount of data to support at 80 bytes, which means a BMC must support at least 5 of these 16-byte "blocks" which can be individually accessed via the set selector. Aside from the first 3 bytes which must be an IANA ID number, the rest of the data is defined by us. That is basically all there is to it. Setting a boot order this way overrides the existing order from NVRAM if there is one. Parameter 7 doesn't have a 'persistent' flag so the contents need to either be manually cleared from the BMC or cleared via the "Clear" button in the System Configuration screen. From the machines I've been able to test on at least AMI BMCs support the mailbox, and hopefully OpenBMC will be able to add it to their IPMI implementation. This is supported in Petitboot as of v1.10.0 so go ahead and try it out! Last month, I was in Amsterdam at OpenPOWER Summit Europe. It was great to see so much interest in OpenPOWER, with a particularly strong contingent of researchers sharing how they're exploiting the unique advantages of OpenPOWER platforms, and a number of OpenPOWER hardware partners announcing products. One particular area which got a lot of attention at the Summit was OpenCAPI, an open coherent high-performance bus interface designed for accelerators, which is supported on POWER9. We had plenty of talks about OpenCAPI and the interesting work that is already happening with OpenCAPI accelerators. I was invited to present on the Linux Technology Centre's work on enabling OpenCAPI from the software side. In this talk, I outline the OpenCAPI software stack and how you can interface with an OpenCAPI device through the ocxl kernel driver and the libocxl userspace library. My slides are available, though you'll want to watch the presentation for context. Unfortunately none of their videos are up yet, but they'll be there over the next few weeks. Keep an eye on the Summit website and the Summit YouTube playlist, where you'll find all the rest of the Summit content. If you've got any questions about OpenCAPI feel free to leave a comment! I recently had the pleasure of attending the 2018 Open Source Firmware Conference in Erlangen, Germany. Compared to other more general conferences I've attended in the past, the laser focus of OSFC on firmware and especially firmware security was fascinating. Seeing developers from across the world coming together to discuss how they are improving their corner of the stack was great, and I've walked away with plenty of new knowledge and ideas (and several kilos of German food and drink..). Ryan O'Leary giving an update on Linuxboot - also known as NERF, Google's approach to a Linux bootloader all written in Go. Facebook presenting their use of Linuxboot and "systemboot"
And heaps more, check out the full playlist!